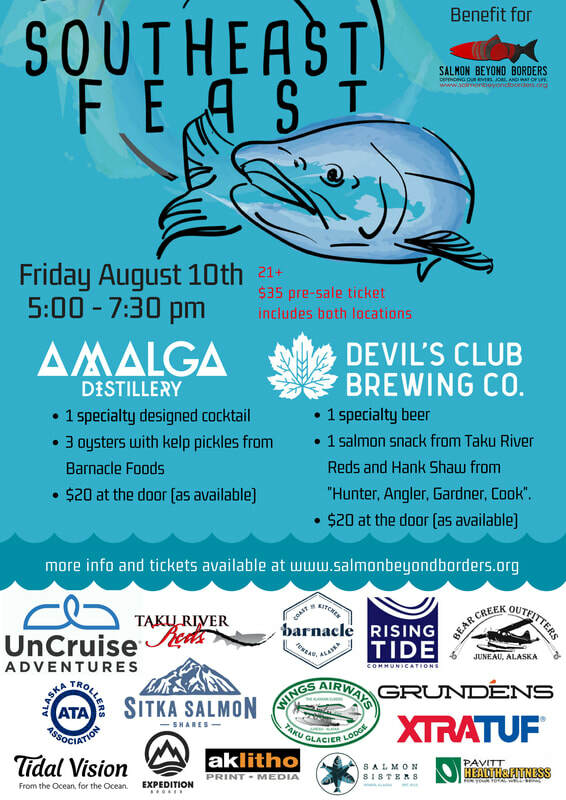 Amalga Distillery and Devil's Club Brewing Company will play host to a social hour highlighting Southeast Alaska's world class seafood bounty and raising funds for the work Salmon Beyond Borders does to defend the wild salmon of the Taku, Stikine, and Unuk rivers. This flexible social hour will run 5pm - 7:30pm. 1 salmon snack featuring salmon from Taku River Reds (TRR) and prepared by Tyson Fick from TRR and Hank Shaw from "Hunter, Angler, Gardner, Cook". Silent auction items from Taku Glacier Flightseeing, Pavitt's Health & Fitness, TidalVision, and Xtratuff will be available for bidding at Devil's Club Brewing Company. This event is part of a week-long celebration of Alaska's Wild Salmon. Restaurants across Juneau will be featuring wild salmon and donating portions of their sales to defend wild salmon habitat. Make a night of it - join us for your appetizer and then visit one of the many Juneau restaurants featuring salmon for your entree! Look for signs around town reading "This business supports Alaska Wild Salmon". Salmon Beyond Borders is a campaign driven by sport and commercial fishermen, community leaders, tribal and First Nations members, tourism and recreation business owners and concerned citizens across the Alaska/British Columbia border to sustain our transboundary salmon rivers from some of the largest proposed mines the world has ever seen.